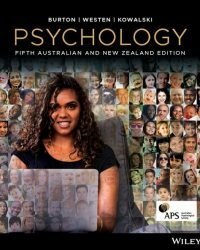 The 5th Australian and New Zealand edition of Psychology, 5th Australian and New Zealand Edition (Burton et al.) enables every introductory psychology student to master the basic concepts of Psychology through proven pedagogy and meaningful ‘tales from the front’ videos with practicing psychologists, and will not only provide you with the knowledge you need for your course, but will also become a go-to text throughout your degree. Available as a full colour printed textbook with an interactive eBook code, this title enables every student to master concepts and succeed in assessment by taking the roadblocks out of self-study, with features designed to get the most out of learning. You can expect components such as topical content embedded in the text, video cases and ‘tales from the front’ videos from practitioners that help connect the theoretical with real-world local cases, instructive interactives and Concept Check questions embedded throughout the text that provide instant feedback to reinforce the concepts you’re learning about in the text, and ensuring students get to have the best of both worlds, with the ability to switch between reading something tangible and studying with online (or offline!) learning resources, through the ability to search, highlight and take notes within the text for more efficient study. Learning objectives at the start of every chapter to guide you through the material to be learned. Each chapter opens with a concept map that corresponds with key psychological topics that will be explored. Australian and New Zealand academics have provided expert commentary on one or two key issues covered in each chapter, often presenting both sides of the debate. In each chapter, an ethical dilemma is posed to help you better understand and apply the APS code of ethics. End-of-chapter review, discussion and application questions to test knowledge, understanding and higher order thinking and analysis.